Recycling plastic requires strict QC processes, highly trained and engaged staff and a culture of responsibility. Values and processes that Vanden embodies in all that we do. Our clients rely on us to produce recycled material of the highest quality and purity, which can enter the manufacturing process. We want to share with you the processes we have in place to ensure our consistent supply of material is of the highest standards. From day one, we have been committed to inspecting each delivery as soon as it enters our recycling site. In doing so, we can determine the type and grade of each plastic before it enters our process. Part of our responsible approach to plastic recycling is to offer full trace-ability and transparency throughout the entire recycling process. The details on the sticker allow us to meet this objective. The plastic can be identified throughout the entire re-processing journey and enables us to efficiently communicate all details with the customer and supplier. How else do we ensure pure product? In our facility, we operate a strict policy of ‘dedicated lines’. This means that we will only process specific types of plastic on each of our four lines. Each machine is “locked down" to exclusively process and granulate one material type only ensuring that there is zero contamination - a pure, clean product is ready to re-enter the supply chain. Our commitment to supplying the highest quality regrinds is exhibited throughout the entire process, but perhaps more so in the analysis that we undertake in quality control. Every bag of material that has been reprocessed with Vanden, has been tested using a range of methods that are appropriate to each polymer type, before being graded. Taking an MFI reading provides evidence of the melt flow of a material, which in turn allows us to identify the correct application and customer for it. PET is subjected to oven testing, whereby the baking process will identify any contamination's and barrier layers. Any batches found to be contaminated are rejected - we also conduct IV testing. Other methods of quality control executed at Vanden include sink/float tests, a simple method that quickly highlights contaminated material via contrasting densities. 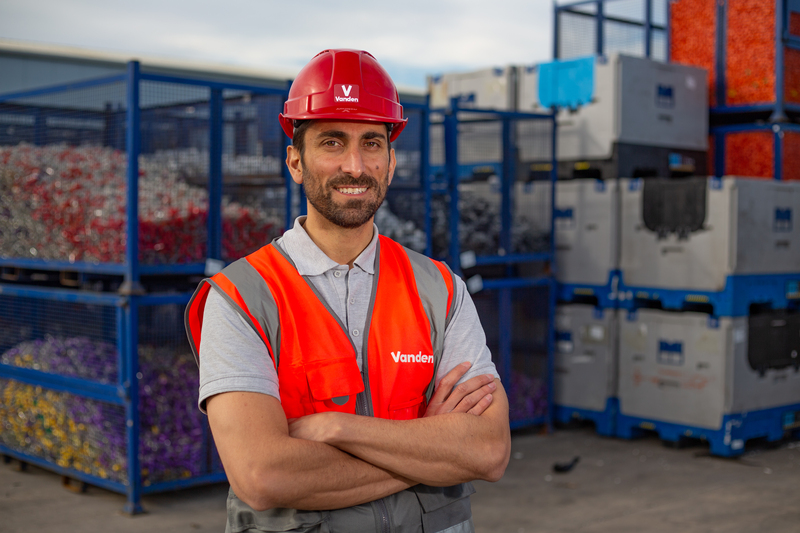 The team at Vanden possess an unparalleled amount of knowledge, experience and vigilance when it comes to plastic, and we have built a culture that thrives on consistent learning, each and every day. From organised sessions, to learning through process application and proactive discovery, we all strive to take ownership and accountability in all that we do. Through education on areas such as legislation, polymer identification and effective segregation, we can pass on this knowledge to our suppliers’. This partnership empowers them to make decisions that enhance their supply chain, recycling capability and quality of material, which in turn, safeguards the quality of our regrinds. Through creating reciprocal partnerships with our customers, we can work with them to ensure that materials are contaminate free. Our honest and trusted approach sees us continuing to grow as a business, strengthening relationships and supplying plastic with an unrivalled reputation for being of the highest quality, in markets across the world.